Title: Sun Shines on 3015...Finally! Description: ARR 3015 at Stacy St. yard. Starbucks HQ is in background. 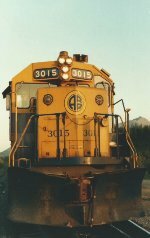 Description: Is this the only train anywhere that runs once a month, the first Thursday, September through May, Anchorage to Hurricane, AK and return (schedule is very different in the summer)? Description: This is Whittier Junction. ARRs Glacier Discovery runs daily in the summer Anchorage to Whittier in the morning and Whittier to Anchorage in the evening. Midday it meanders among the glaciers south of Portage. Description: ARRs Glacier Discovery runs daily in the summer Anchorage to Whittier in the morning and Whittier to Anchorage in the evening. Midday it meanders among the glaciers south of Portage. Title: The Glacier Discovery Headed for Whittier the Second Time This Day. Description: Bear Creek is between the two tunnels on the Whittier Branch. ARRs Glacier Discovery runs daily in the summer Anchorage to Whittier in the morning and Whittier to Anchorage in the evening. Midday it meanders among the glaciers south of Portage. Description: ARR 3015 in Anchorage train station. 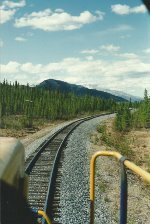 Description: The MEX (McKinley Express) is operated by ARR for Princess Lines in the summer Whittier to Princess's Lodge near Talkeetna and return each Saturday and Monday. The train is based in Seward. Description: Awaiting it's next trip into the last frontier. Description: As the days were getting longer, the Aurora Winter Train became a viable option to go and shoot. During the winter, this train will leave Anchorage on Saturday morning and run to Fairbanks. The next morning, it will depart Fairbanks and head back home to Anchorage. Here it is running through the middle of nowhere (I was out on some snow mobile trail somewhere) on its weekly Sunday run.